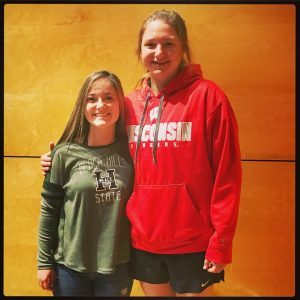 CHRISTAANA ANGELOPULOS has committed to play softball and continue her education at the University of Wisconsin in Madison, Wisconsin. Christaana was a 4-year Varsity starting shortstop, 2 of those at A-West. She appeared in 49 games as a Wildcat (90 overall), and finished her Wildcat career with a .566 batting average, collecting 90 hits- including 27 doubles, 7 triples & 11 homeruns in her two seasons in purple. She drove in 74 runs for the Wildcats and scored 80 runs. She earned First Team All-Conference honors all 4 years, and was selected as Jeffco’s 5A Player is the Year for the 2018 season. She was a two time Honorable Mention All State selection, and then as a senior she earned CHSSA First Team All-State honors. Christaana is also a CHSAA Academic All-State award winner. GIANNA HALEY has committed to play softball and continue her education at Black Hills State University in Spearfish, South Dakota. Gianna was a 4-year Varsity starter for A-West. She appeared in 80 games as a Wildcat, with some behind the plate and then lead the team the past two seasons as our starting centerfielder. Gianna finished her Wildcat career with a .356 batting average, in over 200 at bats. She tallied 72 hits, 57 RBI, 9 doubles, 6 triples, and 4 homeruns (all of which came her senior season). Defensively she was always solid, collecting 111 putouts in over 120 chances and only committed 2 errors in four years! She earned Honorable Mention Jeffco All-Conference honors as sophomore and junior, and then earned 1st Team All-Conference her senior season. 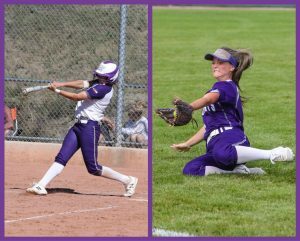 She was also a CHSAA Honorable Mention All-State selection her senior year, and she has also been selected to play in the CHSCA Senior All-State game in Alamosa in June. Gianna is also CHSAA Academic All-State award winner.